According to the official website, SugarCRM is currently deployed by more than two million end users (a large portion of which, many industry analysts assume, are using the free Community Edition) in over 120 countries and 26 languages all over the world. Among their customers, which are using the enterprise solutions of SugarCRM, there are companies like IBM, Mitsubishi, Audi AG, HTC, Agfa Healthcare, Sherwin-Williams, Sennheiser Electronic, Live Nation, Rebook, T-Mobile, and Zurich Insurance Group. Starting from Sugar 7, which is not available as Community Edition releases, it can be considered a Software as a Service (SaaS) product, whose customers can choose to use an on-premises product, SugarCRM’s Sugar Cloud, one of SugarCRM’s partners, or public cloud services such as Amazon Web Services, Windows Azure, Rackspace Cloud, or IBM Cloud. All of the classes which implement this method have a “dangerous” destructor method, so I guess they thought abusing destructor methods is the only way to exploit this kind of vulnerabilities… But what about other classes and magic methods which might be abused as well (for example, to build a “POP chain”)? 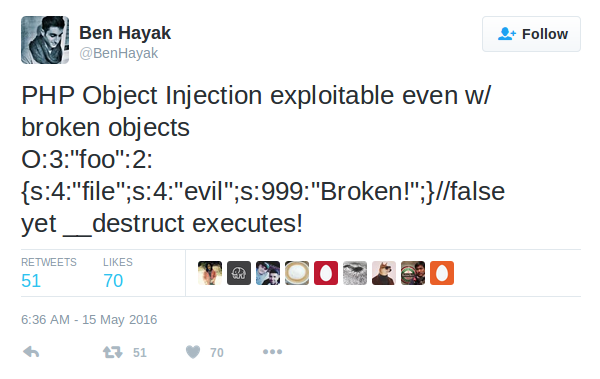 Anyway, the point is they were still using the unserialize() function with user input thinking to be safe from object injection attacks, but I always told them that this solution should be considered just a workaround for specific attack vectors and not an effective patch for the vulnerabilities. In fact, after a couple of years, in the summer of 2014, I came back to them saying that CVE-2012-0694 was not completely fixed yet, and the vulnerabilities could still be exploited by abusing other classes, like PHP’s built-in classes, or exploit memory corruption vulnerabilities like these type confusion bugs. I tried to suggest once again to switch to json_encode() and json_decode() functions and never use unserialize() with user supplied input, but my advice was rejected because JSON functions might have some negative effects on performance. So, I was digging into the new CE version (6.5.23), which should solve my vulnerabilities, and unfortunately I found out that the fix you’ve used could be easily bypassed, as you can see here: https://3v4l.org/oc2cY. This means that CVE-2012-0694 is still not completely fixed in the latest SugarCRM versions, as well as the most recent REST vulnerability, which means that unauthenticated attackers might be able to inject arbitrary objects into the application scope, potentially leading to execution of arbitrary PHP code (or shellcode when exploiting PHP internal vulnerabilities). Basically, this means that my 4+ years old vulnerability (CVE-2012-0694) has never been fixed actually. By sending a specially crafted serialized string with broken data, the resulting unserialized object’s __wakeup method will not be called, bypassing what you’ve been using to “prevent unserialize vulnerabilities”. Considering also the other bypass which concerns your incorrect input validation fix, this means that all current versions of SugarCRM are vulnerable to my old Object Injection vulnerabilities, which can be exploited by authenticated attackers only, as well as to the REST Object Injection vulnerability, and this one can be exploited by unauthenticated attackers. In other words, all of the SugarCRM instances out there are vulnerable to unauthenticated Remote Code Execution (RCE) attacks. I hope you understand how this is critical and dangerous, and so I believe you should communicate this incident to your customers ASAP, providing a working patch in a timely manner! According to this Tweet, the broken objects issue has been reported to the official PHP bug tracker in May, but it looks like they had no intention to fix it at that time. Strangely enough, after a couple of days from the release of SugarCRM Community Edition version 6.5.24 and other commercial versions – which should finally solve both CVE-2012-0694 and KIS-2016-07 – in July, someone else reported a very similar bug, also providing SugarCRM as a real-world example for exploitation of the issue. What a surprise, this time the bug has been accepted and fixed in PHP versions 5.6.25 and 7.0.10, and today it is also known as CVE-2016-7124. Now you might say something like: “Is this the end for these vulnerabilities?! SugarCRM now “properly” validates user input before using the unserialize() function, and PHP has released fixed versions to avoid the __wakeup method bypass… I’m using updated versions of both SugarCRM and PHP, what could possibly go wrong there?” Firstly, while SugarCRM is now validating user input not to allowing arbitrary PHP objects to be unserialized, the fact is that the unserialize() function is still being used with user input, so there are still chances for both authenticated (CVE-2012-0694) and unauthenticated (KIS-2016-07) attackers to exploit PHP internal memory corruption vulnerabilities which do not require objects declarations, like this ten years old vulnerability which requires just an array definition or this one which relies on references and arrays declarations. Secondly, the CVE-2016-7124 bug is not the only way to bypass protections which rely on the __wakeup magic method. For instance, another way to bypass the __wakeup method is by leveraging the “classmap” option for a PHP’s built-in SoapClient object, which might allow an attacker to inject arbitrary PHP objects without invoking neither the __construct nor the __wakeup method. Part 2 – The Month of SugarCRM Security Bugs? Getting inspired by the vulnerability described in sugarcrm-sa-2016-007, I started looking for similar vulnerabilities in the latest SugarCRM CE version (namely 6.5.24), and I think I discovered a different vulnerability within the MergeRecords module, file /modules/MergeRecords/SaveMerge.php [...] I did manage to create a new administrator user while being authenticated with a non-admin user account by sending the following HTTP request [...] Please note that this kind of vulnerability could be abused to create an arbitrary SugarBean, so the admin user creation is not the only possible attack vector. For instance, this can also be exploited to achieve arbitrary PHP code execution (RCE) by injecting arbitrary serialized PHP objects into the “user_preferences” table (specifically, into the “contents” field), and probably by other means too. At this point, I decided to stop my hunting, especially due to a summer trip coming up, but also because I was pretty satisfied with my results: even though all of the vulnerabilities can be exploited by authenticated attackers only, three out of five might allow a malicious user to execute arbitrary PHP code (RCE) – well, actually also exploitation of the Blind SQL Injection vulnerabilities could indirectly lead to Remote Code Execution, but that’s another story… On the other hand, I think I could have keep going at the same rate, probably reporting one vulnerability/weakness per day throughout the month of August… That’s one of the reasons why I ironically wrote the following postscriptum when I reported the Second-Order PHP Object Injection vulnerability: don’t worry, for me August is not going to be the month of SugarCRM security bugs, I promise this is the last security report that I send! Well, almost nine months have gone by, and all of these vulnerabilities are still there (so they are 0-days), affecting also the latest SugarCRM Community Edition version, namely 6.5.25, which has been released some weeks ago! However, it looks like they probably – and silently! – fixed some of the vulnerabilities in certain commercial versions at some point between September and October, because I wasn’t able to reproduce the issues anymore with one of their free trial websites, which usually run the latest SugarCRM Enterprise Edition version. It’s just an assumption, I’m not sure whether and exactly which commercial versions include fixes for these vulnerabilities, also because there are no security advisories on the matter published on the SugarCRM website yet. After a while, in mid-September, I decided to listen to the voices in my head, which were saying that these vulnerabilities would have probably been fixed after several months, particularly given my previous experience… Therefore, since the same security bugs affected SuiteCRM as well, which is a SugarCRM fork, I decided to report the issues also to this other open source project, and those guys have quickly solved the vulnerabilities with a couple of new releases of their software. By the way, I’ve already been in contact with these guys at the end of June 2016, when I sent them another report about the CVE-2012-0694 and KIS-2016-07 vulnerabilities, because both were affecting SuiteCRM as well, and considering also the “new” CVE-2016-7124 bug – and the fact that waiting for SugarCRM to release fixed CE versions was unacceptable, considering their timing with regards to security updates – I thought it was fair to alert them about the related critical risk. Indeed, they released new SuiteCRM versions just after a week from my report, which solved the vulnerabilities by removing the SugarRestSerialize.php file altogether, in order to fix KIS-2016-07, and switching to JSON functions to fix CVE-2012-0694, instead of keep using unserialize() with user input. Thank you for contacting SugarCRM to report a potential security vulnerability. We take security and the protection of our customers’ systems and data very seriously, and we appreciate the time that you have taken to inform us of this vulnerability. We request that you register for an account on our website at www.sugarcrm.com and reply back to this email to inform us of the username that you have registered. A registered account will grant you access to our Support Portal, where you can track the status of this vulnerability report, in addition to providing an outlet for communication between you and the SugarCRM security team. We ask that you refrain from publicly disclosing this vulnerability until a remedy has been developed and released. We will ensure that you remain updated during the vulnerability identification and resolution process through the Support Portal. (Un)Fortunately, I was still in the middle of my summer trip at that time, so I had to postpone my user account registration on their Support Portal. That was completed on September 7, 2016, the day that I entered the “realm of SugarCRM customers”… After logging into the portal, I immediately felt the smell of security bugs, just a sensation… But that was a good one, because it took me just a couple of minutes to discover the first security issue: Stored XSS Vulnerability via Attachment Filename in Case’s Notes. Thank you for contacting SugarCRM Support. I would be more than happy to help you with this. I have set up a FTP account for you to add the files for this. We would need both the Database (in the form of a .sql) and the files (in the form of either .tar.gz or .zip). Once you have added those two files let me know and we can use those files to refresh the dev instance you specified. First obvious thing: an attacker could steal the source code of Professional, Corporate, or Enterprise editions for personal usage without paying for a license, as well as downloading the source code of customized and private SugarCRM modules. The attacker could also publicly release on the Internet the source code of commercial editions ⟹ Game Over! An attacker could have had full access to the SugarCRM’s database of any customer that upload a backup to the FTP server. This could be exploited to disclose lots of sensitive information stored into the DB, as well as potentially gain access to the server where the instance is running by placing a backdoor into the source code ⟹ Sugar Instance Pwned! In case a SugarCRM instance is hosted on an intranet server, not publicly exposed over the Internet, a motivated attacker might “follow” the case resolution process day by day, and when the Support Team will say “ok customer, you can download back your instance from the FTP server and deploy it, now it’s fixed”, she just has to login to the FTP server, download the backup, modify the source code to insert a backdoor and wait for the customer to deploy the infected package. At this point the backdoor may use a reverse-shell to connect back to the attacker’s machine ⟹ Intranet Sugar Instance Pwned! I noticed that some on-premises instances are hosted on edge.sugarondemand.com (70.42.242.50), which is within the same subnet of the updates.sugarcrm.com server (70.42.242.54). This means that when a motivated and skilled attacker has full access to one of such instances, she could try to further penetrate the internal network trying to gain access to the updates server. In case she will succeed, every single SugarCRM instance out there (both on intranets and over the Internet) can be fully compromised by modifying ad-hoc the updater endpoint ⟹ All Sugar Instances “Automagically” Pwned!! At this point I realized that a very similar impact might be achieved also by leveraging the first security issue I discovered on their Support Portal, the Stored XSS Vulnerability via Attachment Filename in Case’s Notes: even though the session cookies are being set with the “HttpOnly” attribute, not to allowing the XSS to be exploited to directly steal cookies and subsequently carry out Session Hijacking attacks, a motivated attacker could have injected a more sophisticated payload or a BeEF hook in order to impersonate the victim user as soon as they open the affected case page containing the XSS payload… I guess the SugarCRM Support Team has access to all of the cases within the Support Portal, so if an attacker manage to hijack their user session, she could have achieved the very same result: read all of the notes stored in the Case Portal with the aforementioned consequences! Part 4 – Pwn a server to rule them all! This means that if an attacker does manage to compromise the updates.sugarcrm.com server, then she might be able to “pwn” every SugarCRM instance out there by exploiting such an over-the-net PHP Object Injection vulnerability, resulting in a sort of “domino effect” in which more than two million SugarCRM instances all over the world might be simultaneously and automatically compromised by modifying ad-hoc the SOAP updater endpoint, such that the SOAP server will send back malicious serialized data which might result in arbitrary PHP code execution – for instance, by leveraging the __destruct method from the SugarCacheFile class to write arbitrary PHP files, like I did in my Metasploit module for KIS-2016-07. However, there might be different ways to compromise and get a shell on the updates.sugarcrm.com server. 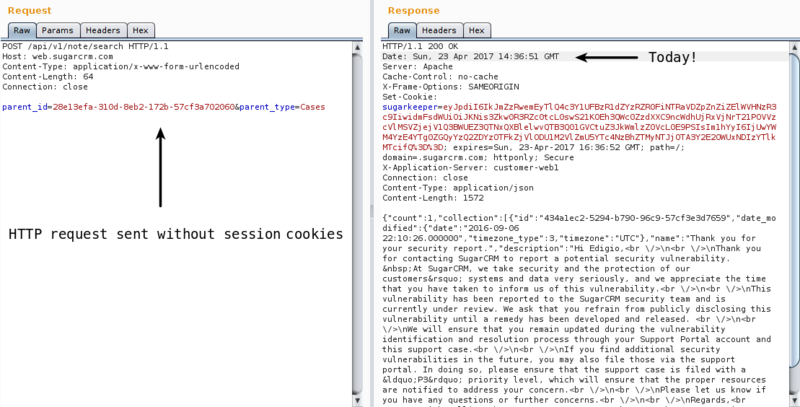 For instance, it looks like the SOAP server located at https://updates.sugarcrm.com/heartbeat/soap.php is currently using the unserialize() function with user input taken from the SOAP request when handling calls to the “sugarHome” SOAP method, which means that an attacker could try to exploit PHP internal vulnerabilities – like this type confusion vulnerability published last January – in order to execute arbitrary code on the updates.sugarcrm.com server and consequently modify the SOAP server in a malicious fashion. On the other hand, compromising the updates.sugarcrm.com server is not the only way for such an over-the-net PHP Object Injection attack to succeed: I’m not sure about commercial editions, but all Community Edition versions are using the NuSOAP library to send out the SOAP requests from within the check_now() function, and by default this library uses the cURL extension without setting the “CURLOPT_SSL_VERIFYPEER” option, which stops cURL from verifying the peer’s SSL certificate and therefore it will establish an SSL connection even with self-signed certificates. This means that certain SugarCRM instances might be compromised even by leveraging DNS cache poisoning attacks where the DNS resolution for the updates.sugarcrm.com host will be translated to the attacker’s computer IP address, in which she might host a malicious SOAP server (with a self-signed SSL certificate) that can compromise all of the SugarCRM instances that will send SOAP requests to it. I’m not a CRM expert, not even a CRM user, so I can’t say anything about how good and effective SugarCRM is in doing its job. On the other hand, I can say that SugarCRM is one of the most insecure web applications I’ve ever seen in my life (and believe me, I tested and reviewed a lot of web applications): I’ve been quite lucky in choosing SugarCRM as target for my experimental thesis, it made me reach some successful results by discovering lots of security issues in it. However, I think there are still room for improvements with regards to SugarCRM security: I’m pretty sure there are still dozens of 0-day vulnerabilities probably affecting commercial versions as well, so I would say that SugarCRM could be the right choice for Capture the Flag (CTF) competitions – for instance, it has been used during HITCON CTF 2016 – or for training exercises in case you want to improve your code review, bug hunting and web exploitation skills… Furthermore, some recent rumors are saying that Apple is going to launch its own CRM system based on SugarCRM… Well, I reckon that Apple security engineers have done a good work reviewing their new system and fixing all of the security bugs inherited from SugarCRM, otherwise also Apple customers might be at risk when their new “Apple CRM” will be alive. So this is the end, I really hope this blog post will make improvements towards the security of the SugarCRM ecosystem. This website uses Piwik, an open-source web analytics software, in order to collect visitors information such as IP addresses, type of browser and operating system, referral informations and pages visited. This is done just for statistical purposes. Your privacy will be respected, because informations collected will not be disclosed to any third parties. By using this website you consent to the collection of this data in the manner and for the purpose described above.